The kitchen above is in a vintage home in Seattle Washington. The designer was The Kitchen Witch. See how creatively they used our Foliage Border in "Antique" in all its forms. 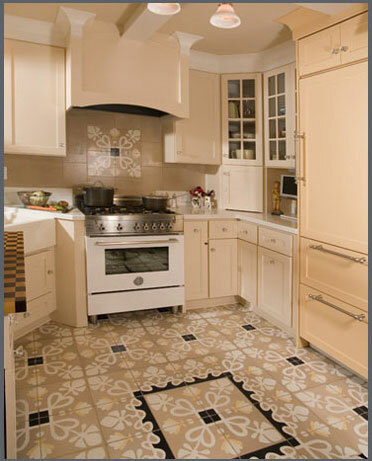 The designer used the corner tile as a field tile which surrounds a medallion made from the regular border tile. Working out a nice design on paper is worth the effort. 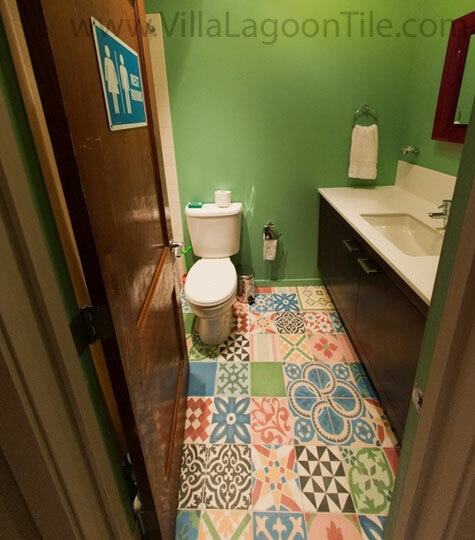 A small bathroom projects style with an interesting floor. 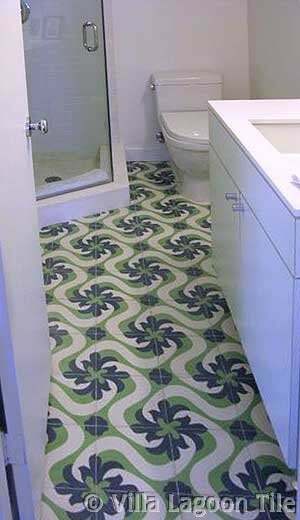 You can certainly take the emphasis off the smaller size of a bathroom with a jazzy floor. 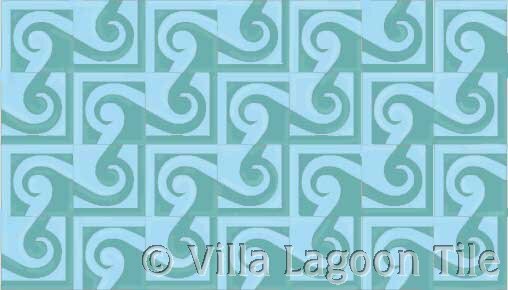 Look how this Cuban tile pattern becomes the focal point for this Miami condo bathroom. 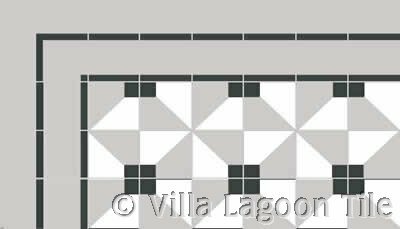 For an upcoming project we have been asked to help design a tile layout for a large outdoor patio at a California home that will soon be undergoing renovation. This is the property of an Oscar nominee actor. The kitchen will be our classic Cubes tile in Black, white and gray. 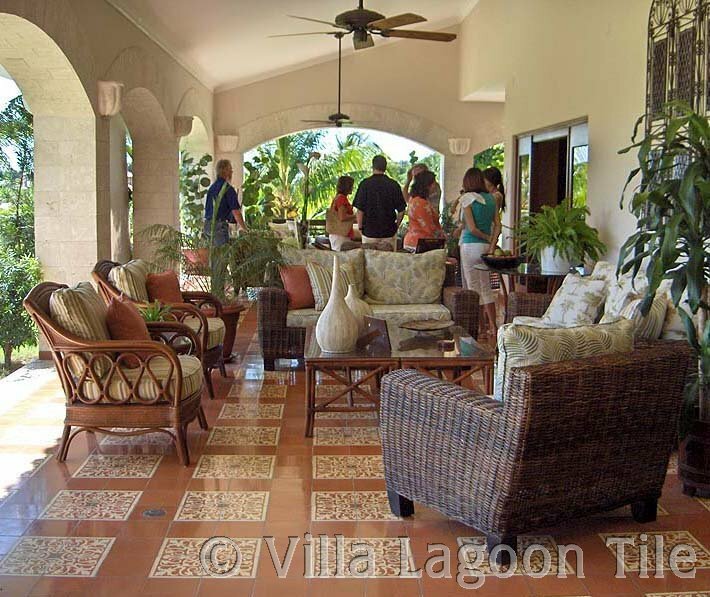 The owner wants a complimentary design for the patio but something on a larger scale. 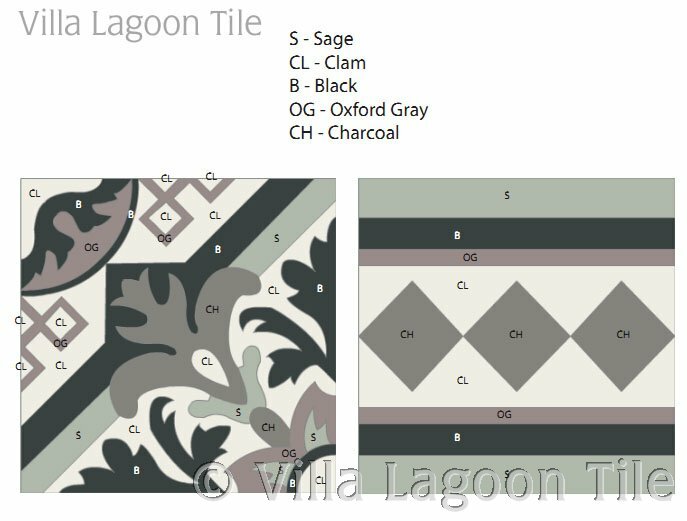 Using our tile design tool we put together an assortment of possible patio tile layouts. 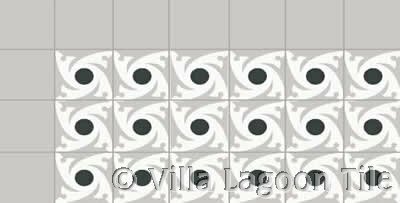 Some are using 8 inch cement tile, others are 12 inch tile. They may opt to have one of our eight inch designs custom made in a 12 inch mold. This is an important project and this home will be featured on television in 2012. So ck back later for links to the TV show when it is announced. You better believe we will feature it on our home page ! Same tile as above, just rotated differently. 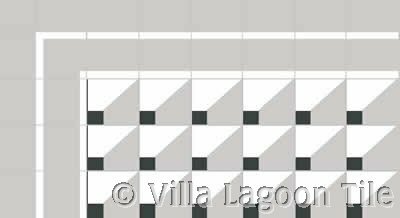 Checkered tile pattern in 3 colors, an eight inch tile. 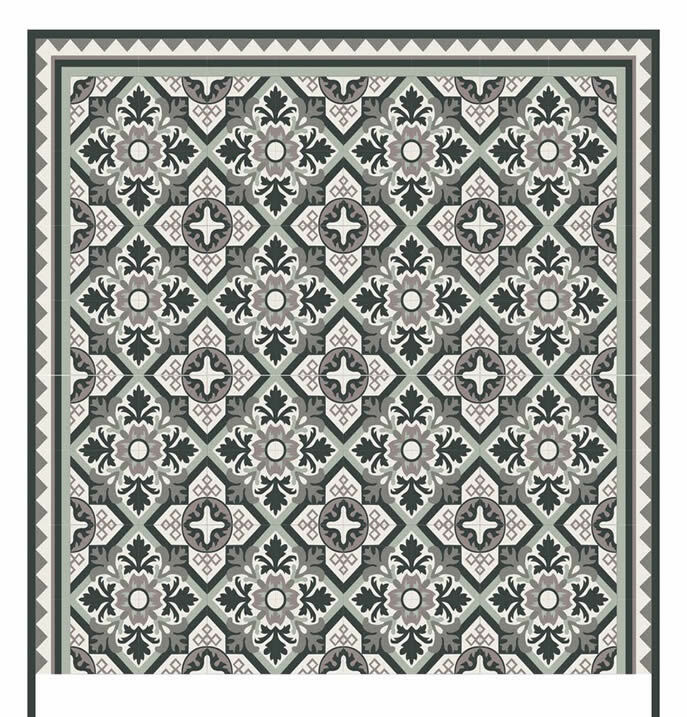 This pattern, Harlequin III is set in offset rows. 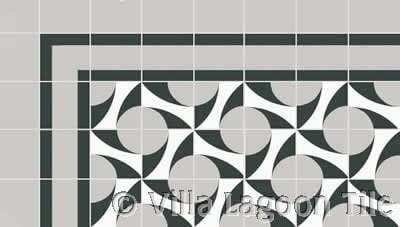 Damsella cement tile in 8"
Of course we will add some photos of the final tile design choice. Want the look of a narrow border and a cost savings at the same time ? One of our clients picked a standard border tile (Ritz) that could be cut in half to create two 2 4" x 8" matching border tiles. See Ritz Border before it is cut below. Very thrifty and just the look he wanted. Not shown in the images is some monochrome black tile from the pattern border to the wall. 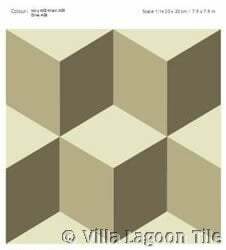 Ritz Border tile and New Castle in custom colors for the field tile. And now a photo of the finished floor. Take the emphasis off a small space's tight dimensions by using a lively floor that gives the eye and mind some entertainment...it works ! 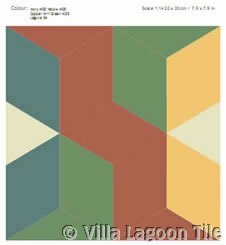 Now check out these variations of floor tile patterns by alternating the colored areas and rotating the tile in different directions as you lay it. And this is only the beginning !! 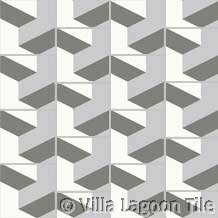 Just look what you can do with one corner tile. We love this look and it reminds us of Art Deco designs. One corner tile is poured two ways, one half of the tiles are the reverse colors of the other. 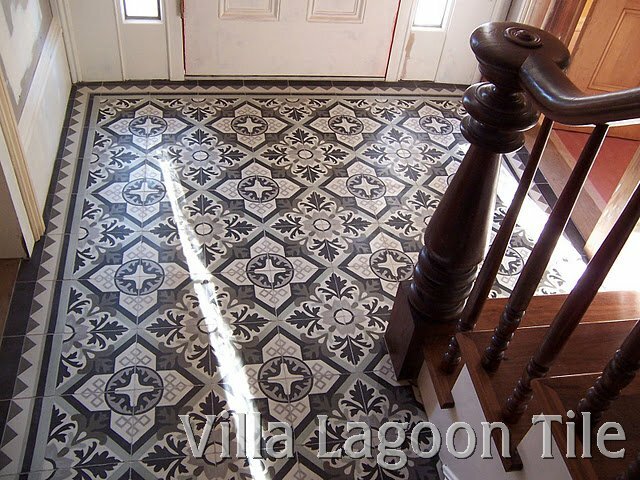 Imagine a jazzy foyer that energizes you every time you come or go. 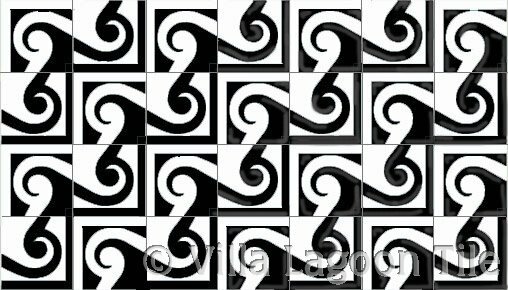 Look at these patterns couple of feet from your monitor to get the real effect. We think this black and white version would look grand with a monochrome black border. Ever wonder what to do with you only have just so many pattern tiles and you need to cover a larger area ? 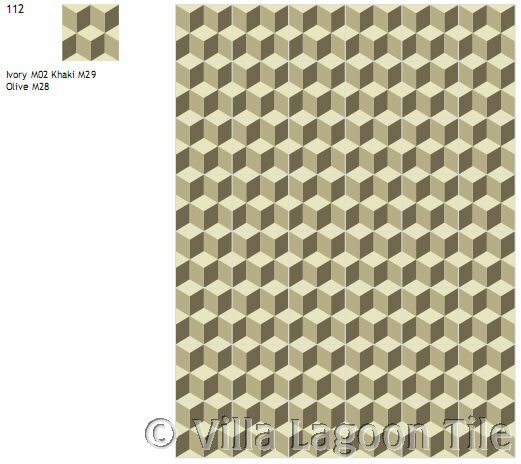 You can create a great layout using the 5 to 4 lattice of five solid tiles to 4 pattern tiles as shown below. 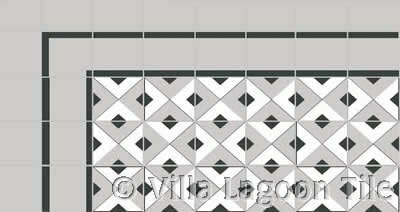 You can get a fabulous look and really save money too as solid color (monochrome) tiles are less expensive than pattern tiles. 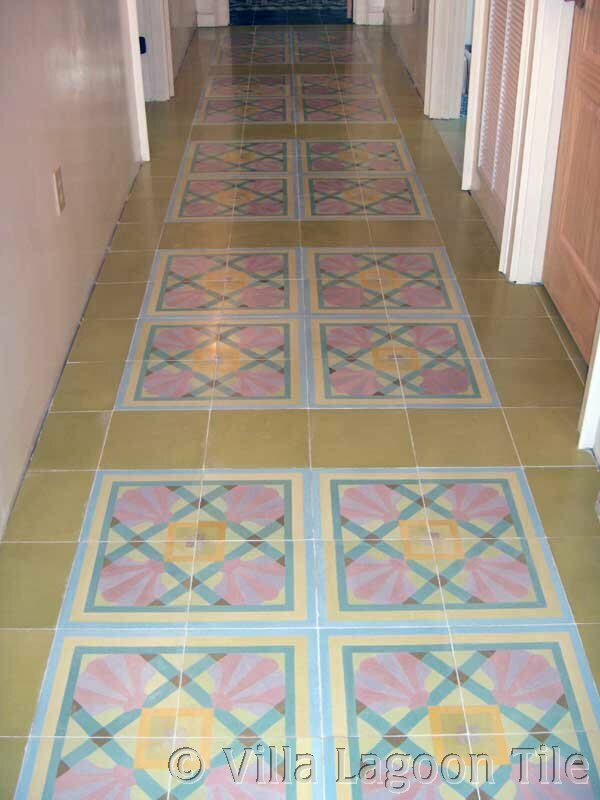 In this photo of a hallway, (baseboards were not yet added) the pattern tile are surrounded by solid color tiles. For continuing updates, read our blog: Cement Style.